Come see the blind man wet himself more like! My personal best in downwind had just increased six fold and the blind man was a tad uncomfortable. 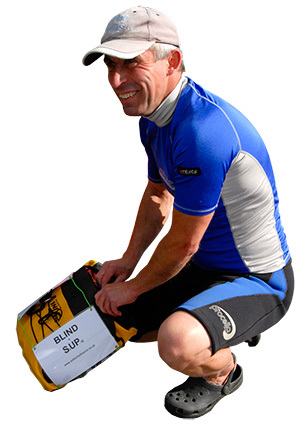 For those of you who missed the last issue of SUPM, my name is Dean Dunbar and I’m a registered blind adventurer. 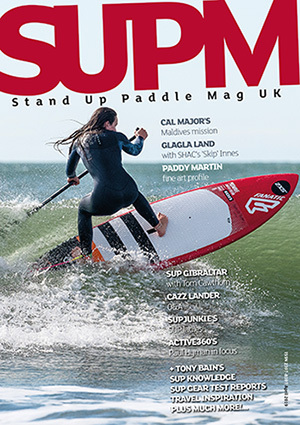 I recently got into SUP and have had a great few months learning the sport. 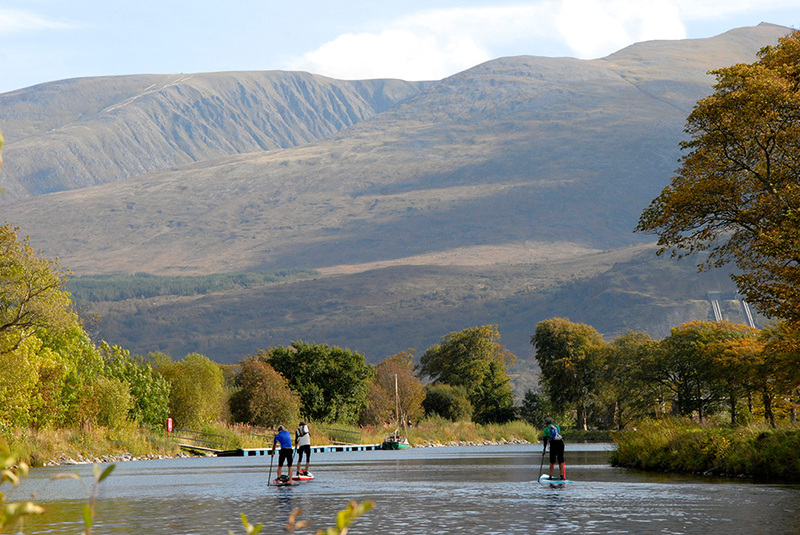 All of my previous SUP adventures had been in training for the ‘Big One’: an attempt to become the first registered blind person to SUP the Caledonian Canal, a.k.a. the Great Glen. 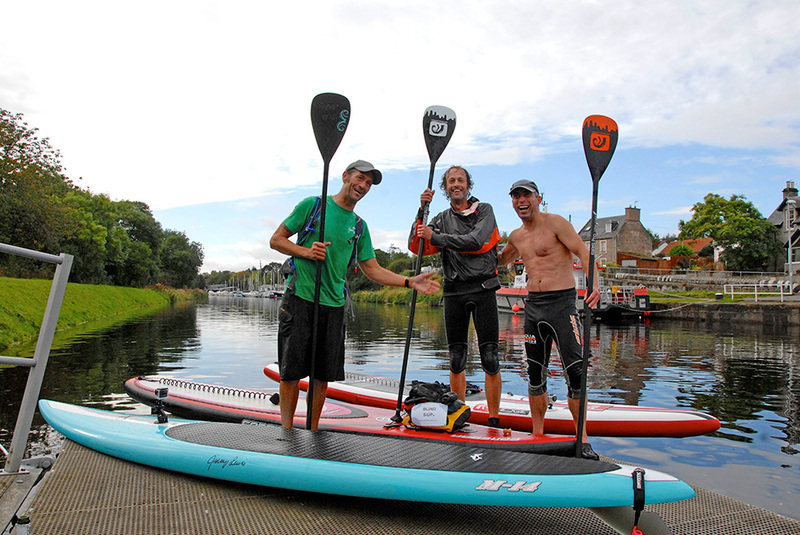 A 96km paddle from Fort William to Inverness, taking in lochs Lochy, Oich, and Ness, as well as multiple canals and locks. All of this was to be done over three days. The forecast for the trip was looking tricky. There was going to be a bit of rain and some wind. There wasn’t going to be much sunshine, but a lot of wind. And, oh yes, did I mention the wind? We started the trip at lunchtime on Thursday October 2 at Fort William. We paddled the first few kilometres through the canals before hitting our first bit of big water at Loch Lochy. As we left the shelter of the canal and entered Lochy, the tailwind picked up from a steady 5-8 knots to an average speed of 17 knots with gusts exceeding 36. This was the strongest wind I had ever SUPed in. As I was getting blown around, Jason and Carl tried to get me to alter my stance from square to surf; but this was no time to start trying new things. All I wanted to do was stay on my board. The waves were not that big, but combined with the wind I was thrown around many times. Landing on my back and front, somehow I never actually went over the edge. 4½ hours after we left Fort William, Day 1 was complete with our arrival at Gairlochy. We had paddled 31km and I was just happy to be dry. That night the two Daves found a wee hostel to stay in and Carl, Jason and I spent the night in Carl’s van, munching down on our Walkers Shortbread, listening to the rain lashing down, with the wind rocking us to sleep. Day 2 was going to be the biggest day of the trip. 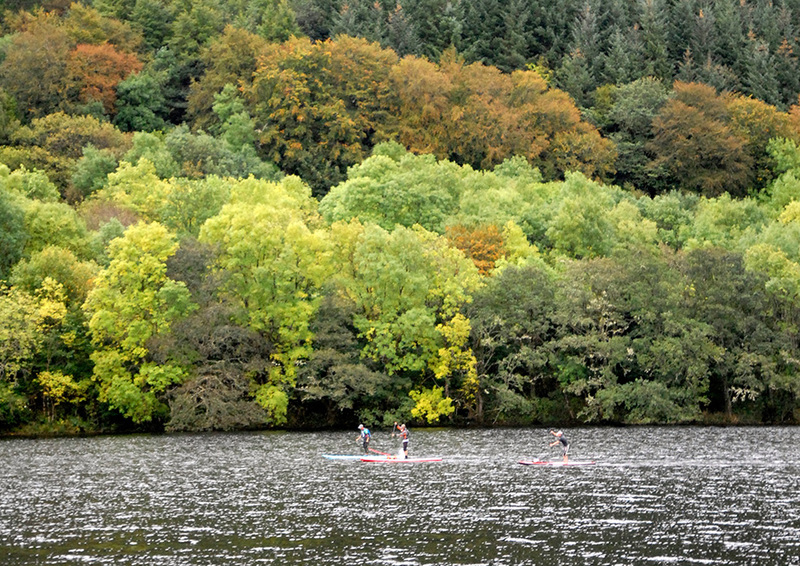 Our goal for the day was to paddle from Gairlochy to Dores, 50km away, on the shore of Loch Ness. After a delayed start, due to the foul weather, we set off at 9.30am, making our way towards Loch Ness. We paddled through several canal sections, including one slightly wider section called Loch Oich. Our final section of canal, for that day, took us to Fort Augustus. The wind was a little stronger than the previous day but, as we were relatively sheltered, it wasn’t actually that bad. In fact, the boys let me go on ahead on my own for an hour, until having to direct me, by whistle, to avoid going down a dead end. This was a great sense of freedom. After a short portage at Fort Augustus, we paddled out into Loch Ness. Within a few minutes we found ourselves half way across the loch and in the middle of a s**t storm. The water was much rougher than on Lochy and the wind was wilder, with gusts exceeding 40 knots. We met up with the two Daves at around 4.30pm and they told us that we still had another two+ hours to go. This was not what we had hoped to hear and, speaking for myself, morale took a bit of a dive. The wind had tailed off and at this rate we would either have to change our finish point, or paddle into Dores in the pitch black. We decided that it was going to be Dores or bust. After a while, Jason spotted that there was still some wind in the middle of the loch, so we made our way out to that and used it. About an hour later, Jason spotted a house, then a couple more buildings, then a village off in the distance. Using his mobile phone, he was able to determine that this was Dores. It was only a mile away, so we got our nuts down and blasted our way to Dores. After eight and a half hours on the water, we spent the night in the pub downing beer and whisky until the early hours. Strangely, on Saturday morning things were a bit hazy. The last wee section from Dores to the finish in Inverness took us just under two and a half hours, at a very leisurely pace. As we came to the end I heard Carl putting on his cag and tightening it up. A dip was coming up and he was getting ready. I did my best to get away from him, but it wasn’t to be. 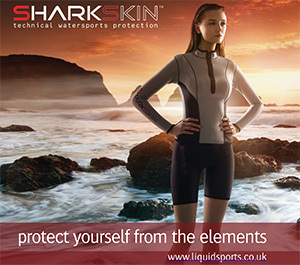 He came alongside, grabbed me and we went for a swim. With a combination of hangover and jubilation on completion of the trip, it wasn’t such a bad thing! 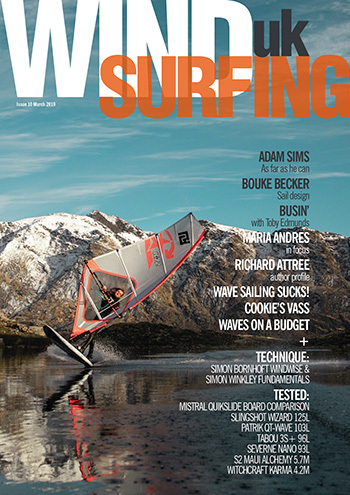 Carl and Jason were both riding narrow 14ft boards (Jimmy Lewis M14 and Red Paddle Elite). As these two have been paddling for several years, these boards were ideal for them and the conditions. However, as I have only been SUPing for six months, my 12.5ft Coreban Sonic from OceanSource.net was a wider and more stable platform for me. I did have a go on Carl’s Red Paddle Elite and think that it is now time for me to step up to a similar board. After all, with our plans for 2015, I’m going to need a faster machine. We were all using the SBS Ultralight Pro paddles, and these were awesome. I already have a lightweight three piece paddle, but these SBS paddles weighed virtually nothing!